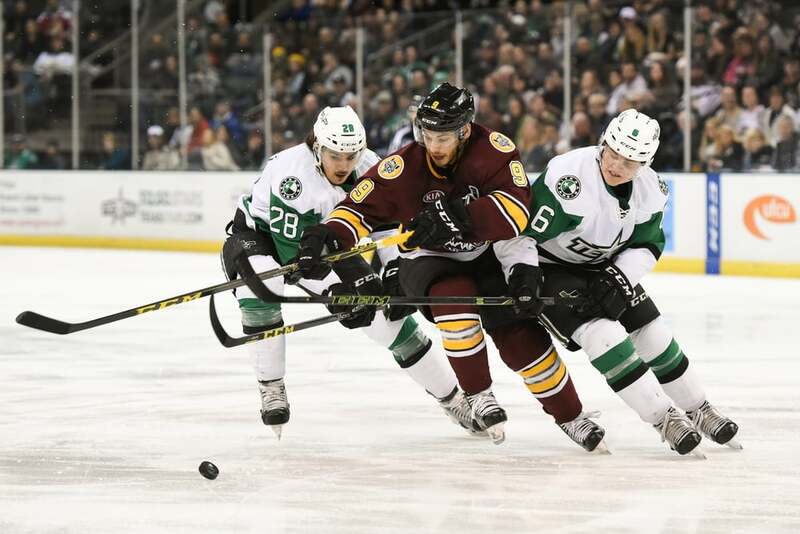 The Texas Stars had a busy weekend, taking on the Chicago Wolves in back to back games Friday and Saturday. It was great series for the Stars as they dominated the Wolves in both games and came away with solid wins in each game. Friday's game was a 3-1 win for the Stars. Philippe Desrosiers was in net for the Stars for both games and he put on an incredible performance on Friday in particular. It was close to being a shutout until a late 3rd period goal by the Wolves. 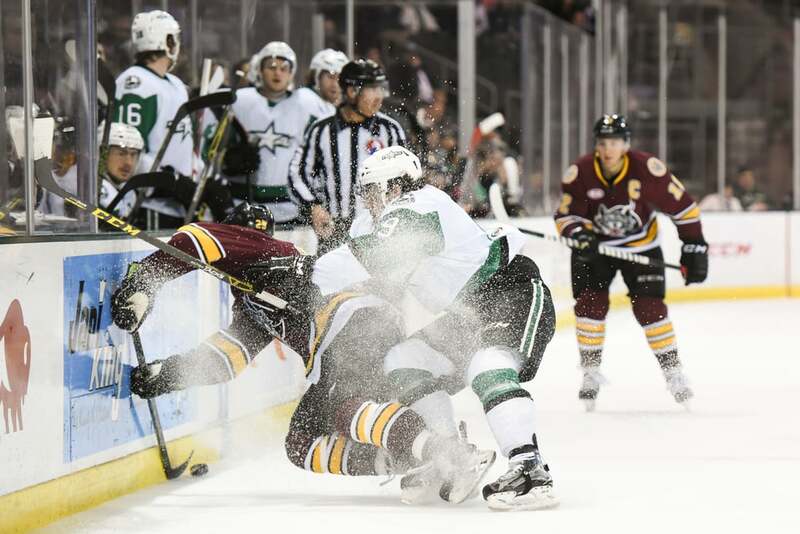 The first shot below is Remi Elie putting a walloping hit on an opponent. The second shot is Esa Lindell giving Desrosiers some defensive help in a battle for the puck in front of the Stars' net. The third shot is a breakaway scoring attempt by Curtis McKenzie, coming in hot in a face to face challenge with the Wolves' netminder. The Stars enjoyed a 5-2 win in Saturday's matchup in front of a packed house at the Cedar Park Center. The first shot below is thwarted scoring chance by the Wolves in the first period. Good defense and solid goaltending kept the Wolves at bay. The second shot is a fierce 2 on 1 battle for puck possession in the Stars' zone. Matej Stransky and Julius Honka teamed up to stop a scoring attempt. The third shot is a second period goal by the Stars as seen from the mezzanine level. If you look closely you can see the puck entering the net below the goalie's glove hand.